My friend shared with me a textbook that her nephew used to learn English. Their family is Korean and the textbook is intended for Korean English as a Foreign Language learners. I flipped through the book and randomly found this page. It troubled me. The examples for the word "pale" might seem innocuous in some ways but if one knows about some of the beauty practices, ideals, and treatments not just in Korea, but all over the world, especially as it relates to the desire to have lighter skin, it's depressing. "Skin: She had smooth dark skin and very dark eyes." "Fair: She has blue eyes and fair skin." "Dark: She has relatively dark skin." Am I reading too much into this? Maybe, but also maybe not. Think about what you know about your first language and the nuances you understand. Then think about a second language that you might know, but didn't learn as a small child. If you learned it in a formal environment, then there's a strong likelihood that you used a textbook. Textbooks can't cover everything there is to learn with a language; therefore, it's not strange to assume that textbook authors choose to include language and information that they either deem as important or as something that might come up and for which learners must express. When I read these examples, I wondered what prompted the authors to use them; they must come up often enough that the authors thought they should be included. I'm not sure how wide-spread it is, but I've seen various news reports about skin bleaching among different ethnicities, including Koreans. An article in the Indian Journal Of Dermatology, Venereology & Leprology by Malathi and Thappa even goes so far as to state that "women, especially Asian women are obsessed with fair skin and they would go to the ends of the earth to lighten their skin color as in most cases their marriage prospects or career opportunities are dominated by the hue of their skin" (p. 842). 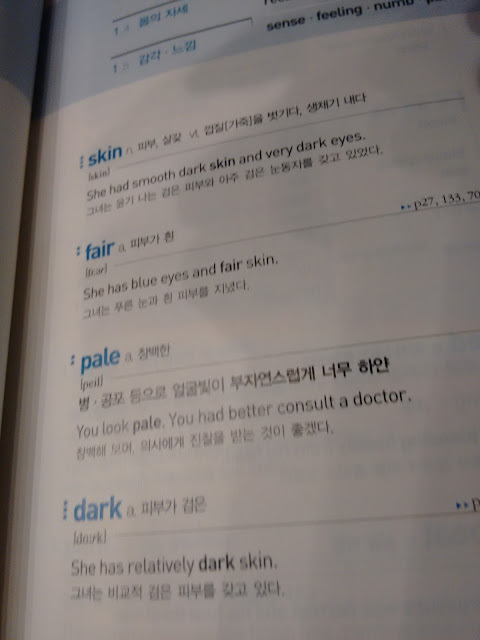 Do I think it's a coincidence that this textbook defines what "fair" and "dark" mean, and apply them to skin tones? Nope. This is something that must have been used commonly enough that it was used as a topic to teach these words' meanings. After all, fair could have been defined as it relates to the weather and dark could have referred to night time. These words have an effect on learners' perceptions of the world. Malathi, Munisamy, and Devinder M. Thappa. "Systemic Skin Whitening/Lightening Agents: What Is The Evidence?." Indian Journal Of Dermatology, Venereology & Leprology 79.6 (2013): 842-846. I understand what you are saying. But Korea has a different culture than we both have ... and that's okay by me. Best wishes on this Whit Monday.